Who are the Medieval Murderers? The original Medieval Murderers. 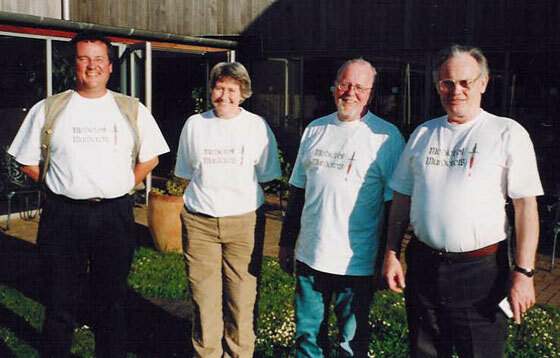 From left to right: Mike Jecks, Susanna Gregory, Ian Morson and Bernard Knight. 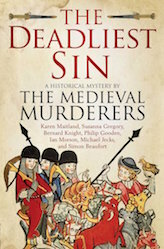 The Medieval Murderers are a group of authors available for speaking events. 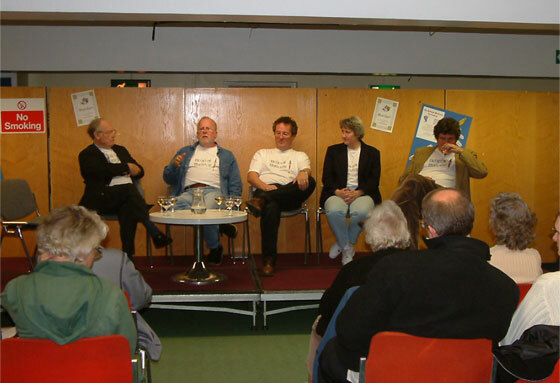 The members are: Bernard Knight, Ian Morson, Michael Jecks, Karen Maitland, Susanna Gregory (aka Simon Beaufort), Philip Gooden and CJ Sansom. 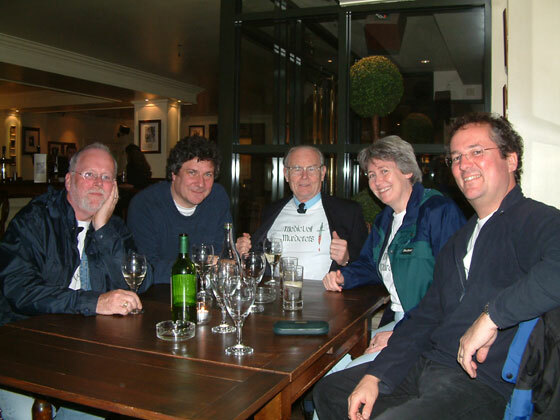 We regularly attend literary events together or in smaller, more manageable groups. The Medieval Murderers pose before an event in Lincoln. 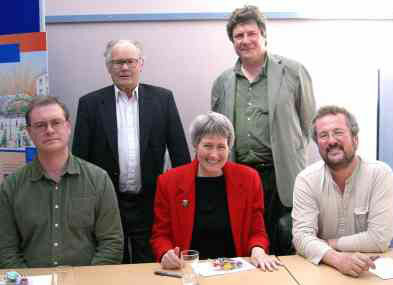 From left to right: CJ Sansom, Bernard Knight, Susanna Gregory, Philip Gooden and Mike Jecks. Promising medieval mayhem, murder and magic, the Medieval Murderers are a very popular performance group whose aim is to leave the audience laughing. With a wealth of anecdotes and jokes about writers, writing, publishers and Merrie, Murderous England, the Medieval Murderers are now one of the top speaking groups of writers in the country. Medieval Murderers offer a range of talks, with two to four Murderers speaking together, or can provide a full workshop event to last a whole day for writing groups, creative writing courses and libraries. The Medieval Murderers regularly give talks in libraries, village halls, stately homes and even castles. It was during a tipsy evening in a pub, just after we had finished speaking at an event in Guildford in 2003, that we first mooted the notion of writing a book together. We thrashed out the idea a bit more after an appearance in East Grinstead, and started exchanging emails about a possible theme a few days later. This is how the idea for writing together originated. It was a lot of fun, and Ian Morson has collected every email that has ever been exchanged between us, which he says is for posterity. As we can sometimes send two our three each in the course of a day when we are all writing in our disparate parts of the country, they must number in the hundreds by now. A relic seemed a suitably medieval theme for us all, and it went from there. Our first book was entitled The Tainted Relic, and had chapters by Michael Jecks, Bernard Knight, Ian Morson, Philip Gooden and me. We enjoyed it so much that we almost immediately began working on The Sword of Shame. And we haven’t stopped since. These are the Medieval Murderers books, listed in order of publication. Click on the title for more details. A piece of the True Cross is taken from Jerusalem in 1100, but it has a blighted history and brings bad luck to all who touch it. The Medieval Murderers trace its progress from the Holy Land to its modern dénouement. A fabulous sword is forged in Saxon times, but treachery and deceit are its companions. 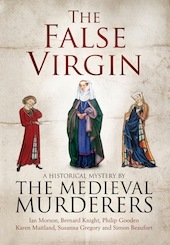 The Medieval Murderers write about its bloody passage through the ages. Bermondsey Priory is the setting for the Medieval Murderers’ third compendium, starting with a murder shortly after its foundation and continuing until an archaeological excavation in modern times. A book of prophecies is written in Ireland in 574, and as it passes down through the ages, those who read it discover that some of its predictions are uncannily accurate. In 1191, a leaden coffin is excavated in Glastonbury Abbey, and the legend on the top claims it holds the bones of King Arthur. The Medieval Murderers follow the progress of the bones until they are excavated a second time at an archaeological dig in Bermondsey Priory, some nine hundred years later. When a meteor lands in Greenland, its finders soon discover that it has healing powers. However, while the ‘sky stone’ is a force for good, its owners do not always use it kindly or honourably. A collection of stories that take place in and around Solsbury Hill and the ancient city of Bath, starting in the Dark Ages and ending with a police enquiry in the twenty-first century. When the Prior of Oseney pens The Play of Adam in 1154, he does not know that murder and mayhem will follow anyone who performs it in the future. A virgin murdered in a chapel receives sainthood, but through the centuries her reputation is threatened by a series of rumours and violent incidents that suggest everything about her might not have been as was initially believed. A group of pilgrims, sheltering at an inn during the terrible days of a poisonous plague, exchange stories of the different sins for which God must be punishing his people.